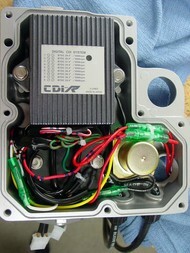 Get that old, corroded e box restored to better than new condition today and spend less time wrenching, more time riding! NEW.....MACHINED ALUMINUM FITTINGS Never worry about the white nylon breaking in the future! it is the old tired corroded wiring, ground terminals,connectors, relay, plug wires etc causing problems. We test the igniter for basic operation, to the rev limit for one minute, This usually proves internal electronics are good. Custom length plug wires and harness lengths no problem. Get that old, corroded e box restored to better than new condition today! WE USE MACHINED ALUMINUM JOINT FITTINGS....No more white plastic fittings that will eventually break and let water in ! 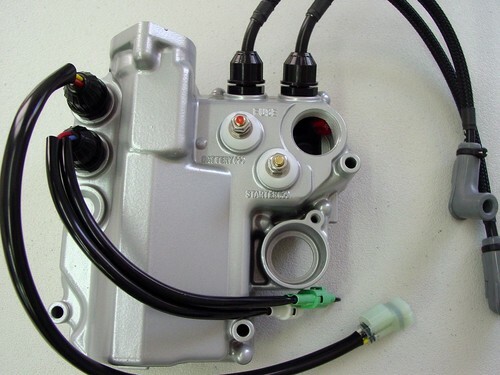 relay remanufactured or replacement OEM only....no China parts! Severely corroded ignitions may have additional cost.